Lutheran worship is about receiving the gifts of God, His Word and sacraments. We respond in faith, prayer, and song, but the focus in our worship service is always on God serving us rather than we serving Him. Lutherans prefer to call the worship service “the Divine Service.” As the name implies, we view the Divine Service primarily as God’s service to us rather than the other way around. To be sure, we praise Him and bring our petitions before Him, but the most important fact is that God gives us two great gifts: His Word and His Supper. Our Divine Service is divided into two parts. In the first part, we hear His Word. Selections are read from the Old Testament, an Epistle (letter) in the New Testament, and a Gospel (one of the four accounts of the life of Jesus). A sermon comments on one or more of the Scripture readings. 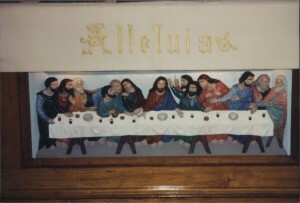 Then, in the second part of the Divine Service, we partake of the Lord’s Supper. Having been instructed in the words of Christ, we receive His body and blood, which forgives our sins and unites us more closely with our Lord. Because we connect the Lord’s Supper with the Lord’s teachings, we make a point of not giving people communion until they have been thoroughly instructed in our Lord’s teachings and confessed their agreement with them. Thus, we do not commune people who are not members of the Lutheran Church—Missouri Synod or one of its sister Lutheran church bodies. However, we invite everyone to be catechized in our faith so that they can receive the Lord’s Supper. Some visitors to the Lutheran Church wonder why we follow the order of service that we do. If you have been to a Roman Catholic mass, you will recognize that the structure of the liturgy is very similar to the Lutheran Divine Service. This is not accidental. Martin Luther and his followers did not seek to establish a new church, but to call the Church of Rome back to preaching the gospel faithfully. It has never quarreled with good, pious, historic customs, but has removed only those practices that it finds contrary to the Scriptures. It retains whatever has been useful. Our Divine Service may be somewhat “formal,” when compared to other Protestant worship services, but that is because we realize that a formal structure best fosters learning, also in spiritual matters. We reject, however, the notion of “ritualism,” the belief that God is pleased when we merely go through the motions of worship without faith or reverence toward Him. We note that ritualism can occur not only in churches with a “formal” liturgy, but also those with a very “informal” one.